, taking the global penetration rate to approximately 60%. . Mobile training not only offers learning on-the-go, but also allows learners to gain an instant access to information whenever and wherever they need it. However, there is often a misunderstanding on mobile learning capabilities and its usage for corporate learning and training. While it is true, that a mobile phone can be used for mobile learning, it is not the only device that can be utilized. One can use a variety of handheld devices such as netbooks, tablet computers, wearable devices, e-readers (kindle for example), etc. as mobile learning tools. Mobile learning targets all such devices equally and learners can use any of these various mobile devices for learning. While a mobile device is used to provide online learning, it doesn’t imply that you will be doing the same kind of e-Learning that you would do using your laptop or desktop. 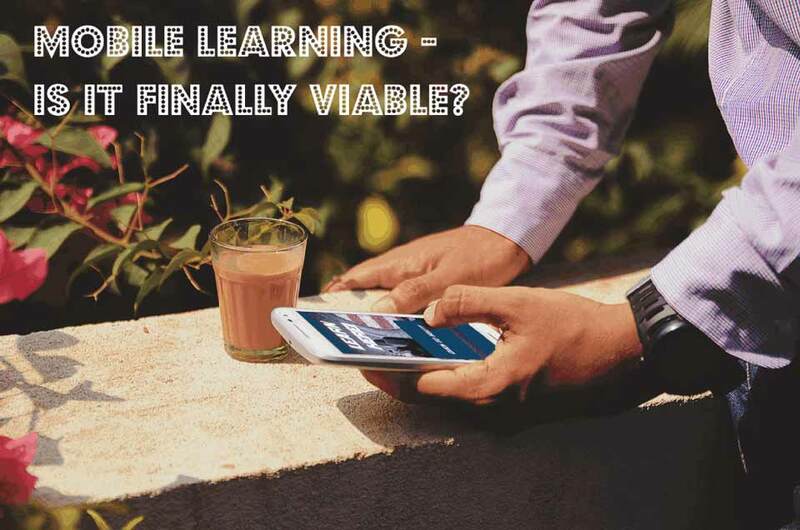 Mobile learning differs from e-learning in terms of the size of courses that can (or should) be provided on mobile devices as well as the context in which mobile learning is accessed. The smaller screen (in most cases) and touch based interaction demands a change in the size of the course and the way it is being presented. If your current content is not mobile friendly, you cannot replicate it for mobile learning purpose. While, it implies learning on-the-go, it is not a prerequisite for mobile learning. Learners can engage in mobile learning even when they are not travelling. The “mobile” in mobile learning also focusses on the devices being used along with the learner’s mobility. Learners have the flexibility and ease of learning through a mobile device and it does not matter whether they are at home, office, etc. or travelling. People presume that smaller screens will not facilitate serious learning and mobile learning attracts distraction. This is not true as mobile learning captures micro-learning approach, which makes it easier for learners to initiate, complete, and absorb learning courses at a time and place convenient to them. And, if we talk about the distractions, it can be there in a classroom training setting as well. It is difficult to exactly find out how and what distracts each individual learners. This is partially true as it is easier to lose a mobile device especially when learners are travelling and this can heavily compromise a company’s intellectual data. However, advanced security solutions coupled with latest mobile technologies allows you to deliver a secured and safe content. Companies can encrypt the content on any device as well as the browser in order to ensure a secure, safe connection. Security settings such as password protection, remote wipe/erasing of data, encryption are minimizing the security risk associated with mobile learning.